With all the bacon-wrapped, deep-fried hurrah these days, it's easy to pass up on the simple, brilliant ideas. 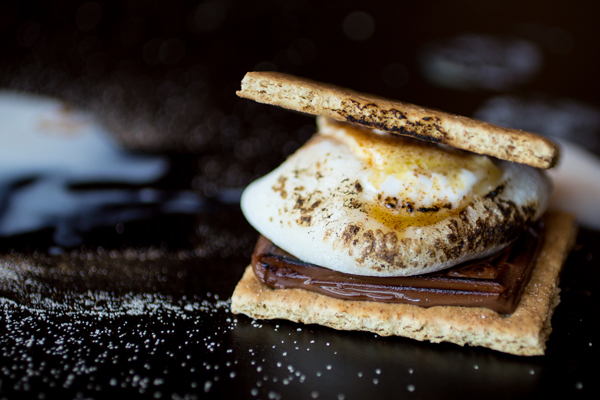 Cue in the S'Mochi -- an invention by Foodbeast reader Ryan Horikoshi. The clever take on the standard campfire s'more swaps the traditional marshmallow with mochi -- a small Japanese rice cake -- instead. We decided to try out the recipe at the Foodbeast Kitchen, opting for vanilla and green tea-flavored mochi ice cream. Using a blowtorch, we were able to quickly toast the sticky rice cake layer on the outside before topping it off with a pad of butter and cinnamon sugar, then sandwiching it between chocolate and graham crackers. The end result: a phenomenal bite of crunchy, sweet graham and chocolate, then soft, chewy mochi rice cake, and finally a cold burst of sweet ice cream. Lesson learned: it's the simple things in life that make your mouthbuds explode. 1. Roast mochi over a campfire (or a blowtorch) until it starts to brown ever so slightly. 2. Place it on top of a graham cracker and piece of chocolate. 3. Top mochi with a pad of butter and sprinkle on cinnamon sugar. 4. Sandwich with another graham cracker.